I just finished up the Laid-Back 31 Day Challenge and I was pondering what I felt like painting next for the blog since my options are now pretty much unlimited. 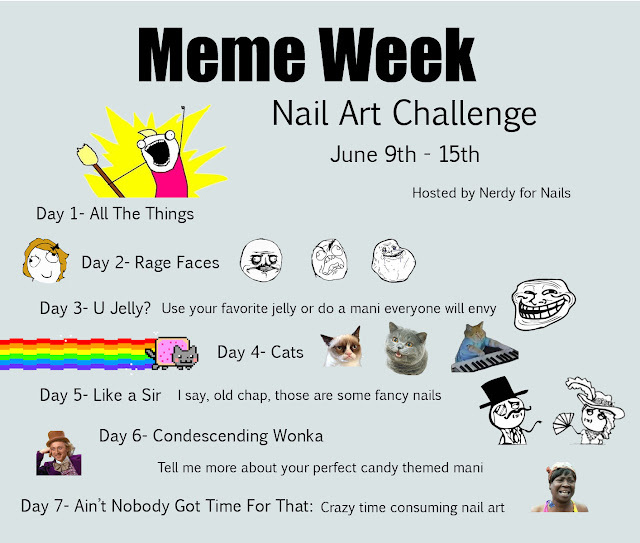 Right away I came up with the idea of memes and started wondering just how many would translate well to nails. One of my favorite bloggers, The Nailasaurus has done a couple totally cute ones here and here. I know I'm not the only one who loves memes so I decided to make it into a challenge so anyone can join in. It'll be starting in a couple weeks and it's open to anyone who's interested.